Not that many decades ago it was understood across our nation that the man of the family was the family breadwinner. Mother’s place was in the home, caring for the needs of the children. That’s changed. For various reasons -including the invention of so many handmaidens in the modern home (washing machine, vacuum cleaner, microwave)- the second adult in the home also commonly works out. So we have the double income family. The question we need to ask today is this: should Dads be satisfied with having Mom go out to work? The Holy Spirit moved the apostle Paul to encourage “younger widows [to] marry, bear children, manage their households, and give the adversary no occasion for slander” (1 Tim 5:14). The same Spirit prompted the same apostle to write on another occasion: “ Older women … are … to teach what is good, and so train the young women to love their husbands and children, to be self-controlled, pure, working at home, kind, and submissive to their own husbands, that the word of God may not be reviled” (Titus 2:3-5). Notice that in both passages the apostle positions the mother in the home engaged with the children. Why might that be? Is the Holy Spirit simply prompting Paul to give this instruction because it was the pattern of the day – and Paul doesn’t want the church to be too out of step with what was culturally acceptable? If that’s the case, we could argue that we need to give different instruction to Dads and Moms today because our society has different expectations. In point of fact, though, Paul -under the guidance of the Holy Spirit!- most certainly did not mind giving instructions to the churches that very much flew in the face of what was socially acceptable in his day. His command to husbands to love their wives in the same way as Christ loved the church (Eph 5:25ff) is one example of many. But more importantly, Paul was steeped in the Old Testament, so that what he thought and instructed was built on God’s Old Testament revelation. It turns out that what Paul instructed Timothy and Titus to teach in their churches was very much in step with God’s Old Testament instruction about who is the family breadwinner. God created male and female, with the instruction to both to be fruitful and multiply (Gen 1:28). But when Gen 2 zooms in on detail about how God created the man and the woman, we note that the man alone receives the instruction of God to “work” the Garden of Eden “and keep it” (2:15). Directly after the fall into sin the Lord addressed the woman in a way that positions her in the family. Said God, “I will surely multiply your pain in childbearing; in pain you shall bring forth children” (Gen 3:16). The pain in childbearing is not limited to the hours of birthing, but includes the discomfort that comes with pregnancy and the strain that accompanies the years of childrearing. The man, meanwhile, is positioned outside the family home, still working the garden: “cursed is the ground because of you; in pain you shall eat of it all the days of your life; thorns and thistles it shall bring forth for you…. By the sweat of your face you shall eat bread, till you return to the ground…” (3:17-19). This raises the question, of course, whether it’s even possible to operate a family on one income in Ontario’s present economy. To answer that question, we need to zero in on priorities. He told the rich young man: “sell all that you have and give to the poor, and you will have treasure in heaven; and come, follow me.” That young man departed much disheartened, “for he had great possessions.” So Jesus told his disciples, “How difficult it will be for those who have wealth to enter the kingdom of God” – harder than for a camel to pass through the eye of a needle (Mark 10:21ff). In his parable of the Sower, the Savior tells how the gospel is preached to all kinds of people – with various results. “As for what was sown among thorns, this is the one who hears the word, but the cares of the world and the deceitfulness of riches choke the word, and it proves unfruitful” (Mt 13:22). That’s striking: wealth can get in the way of enjoying the gospel! Jesus’ Sermon on the Mount includes an instruction not to “be anxious about your life, what you will eat or what you will drink, nor about your body, what you will put on.” Then Jesus adds: “the Gentiles seek after all these things, and your heavenly Father knows that you need them all. But seek first the kingdom of God and his righteousness, and all these things will be added to you” (Mt 6:25ff). The apostles repeat this emphasis in various places, and perhaps Paul sums it up most plainly: “if we have food and clothing, with these we shall be content. But those who desire to be rich fall into temptation, into a snare, into many senseless and harmful desires that plunge people into ruin and destruction” (1 Tim 6:8f). So the question now becomes: how do we best communicate the reality of the danger of wealth to our children? Do we communicate it best by pursuing more? Or do we communicate it better by showing them that we are content with what we now have? I think: here is where deeds speak louder than words. If we say the children are special and so need royal treatment, and then drop them off somewhere so that Mom can get a job in order to maintain the chosen (or achieve the desired) standard of living, we’ve actually told the children that the stuff of this life (for money represents power and control and freedom) is more important than their spiritual wellbeing (something Mother needs to cultivate through 24/7 attention). The children need to see that our priorities center on the kingdom of heaven, and see too what trust and contentment look like. 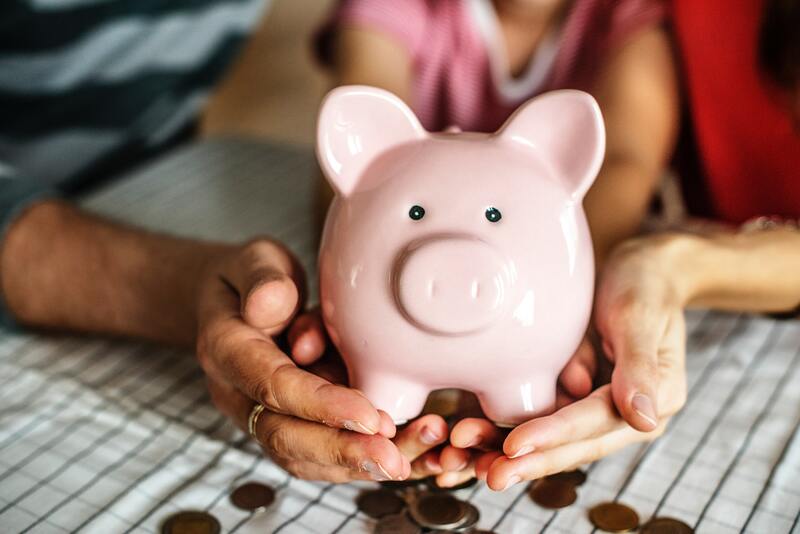 To make this plain to the children, I would encourage that the broad picture of the family’s financial strength be an open secret to the children (of course, depending on their age). It’s healthy to show the children that the top cut of Dad’s income goes to tithing. It’s healthy to explain that the next percentage goes to supporting Christian education for the children; they are that important! Then comes groceries, clothing, mortgage, etc. If that’s tight, there’s no shame in sharing with the children that our family can’t afford to go out for dinner too often or get the trendy shoes others have. Let Dad and Mom communicate that they’re perfectly fine -“content” in Paul’s words- with picking up needed furniture from a second-hand supplier. If holidays need to be at home instead of away, if home can’t afford a Netflix subscription or cable TV, the solution is not to send Mom out to work but is instead to be content with lower standards. For the children are so important that they need Mom’s undivided attention. Her love and labor to show the children what the promises of God really mean are of greater value than an abundance of what passes away. Our own priorities communicate a vital message to the children. Dads can put in longer hours, conceivably hold two jobs (be it that the second is part-time) to pay the bills. That’s not at all advisable because Dad is definitely meant to be a presence in the family and in his marriage (that was the topic of an earlier Bit to Read). Dad could pursue further education so that he can get a better paying job. The further education could eat up a number of evenings so that for the short-term Dad is away from his family for long term benefit. That’s indeed an option worth pursuing. Dad could organize his work in such a way that Mom can play a role in it without short-changing the children in any way. That, it would appear, is what the “excellent wife” of Prov 31 did within the context of the economy of the time. Dad and Mom together could decide that they need to lower their standards and be content with a smaller house and an older car. Perhaps that would work. But what happens when none of these options suffices for the specific needs of the family? What if Dad does not have the stamina for further study or the ability to carry more responsibility at work (and hence a sufficient income)? What if the Lord blesses -yes, that’s the Biblical word- with another baby so that the house is too small and the car is too? We need to dare to be open about the actual struggles we have in relation to money. Scripture says: “If anyone does not provide for his relatives, and especially for members of his household, he has denied the faith and is worse than an unbeliever” (1 Tim 5:8). Jesus Christ gave up everything in heaven and on earth in order to save the undeserving from the eternal judgment of God. If brothers and sisters and cousins and uncles, etc, do not give freely in order to assist a needy son or daughter or nephew or sibling, he has in practice denied the gospel. We need to dare to ask the sensitive and correct questions, and we need to dare to acknowledge that we can’t quite make it. Already every family in our midst (to my knowledge) accepts support for the family beyond what Dad can bring home; I’m referring to Canada Child Benefits and we experience no shame in that. The Lord has promised to supply all our needs, for he said, “Seek first the kingdom of God and his righteousness, and all these things will be added to you” (Mt 6:25ff). He can supply through Dad’s pay packet and through Child Benefits and through the wider family. What’s to happen if the wider family cannot help? Here the church through the deacons has a role to play. We treasure the children and so as congregation we will -must- do all we can to provide the children with what they really need – and that’s their parents’ care as those parents illustrate through word and deed what it means to seek first the kingdom of God.